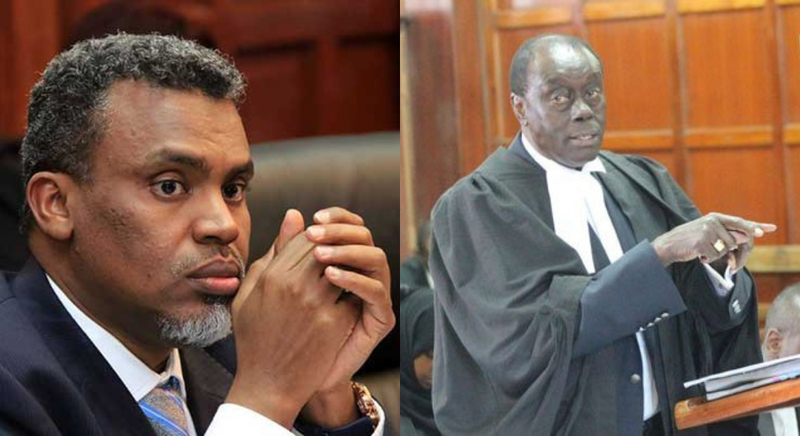 Director of Public Prosecution Noordin Haji wants Senior Counsel Paul Muite disqualified from a case involving the importation of fertilizer due to conflict of interest. In an affidavit filed in court, Haji through his counsel JV Victor Owiti wants Muite to be disqualified from the case saying there is a conflict of interest because he is also Kebs lawyer. Owiti says Muite continues to represent Bernard Oduor Ngesa a clearing agent with Bollore Transport and Logistics Limited and Karimi Lofti, Malika Kirama, Younes Addou and OCP (K) Limited, who are still at large despite being well aware that he is on a long-term retainer with Kebs whose interest in this matter are conflicted by those of the accused persons he is representing. Documents filed in court show Muite has had access to the 26 statements of the witnesses who have been lined up by the prosecution, hence his knowledge of the victims is now clear. According to Owiti, the continued appearance of Muite for the accused persons in the case, with the apparent conflict of interest, is an affront to the administration of justice. Trial Magistrate Kennedy Cheruiyot told the DPP to serve Muite with application to enable him to file a reply within seven days. Furthermore, he ordered that the application be argued by inter-parties on April 24, 2019, before the commencement of the main case. The post DPP Haji’s declares war on senior counsel Paul Muite over fertilizer case appeared first on Kenya Today.